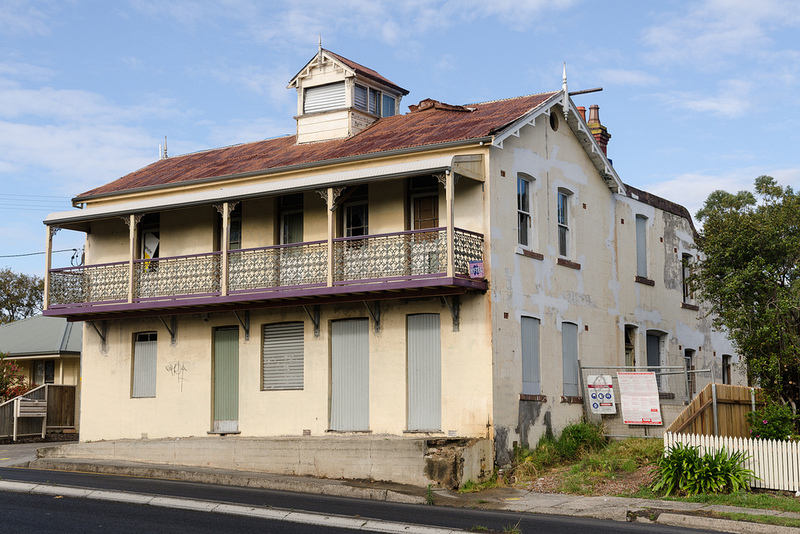 The Old Denmark Hotel, Bulli 2015… Waiting for restoration. YOU can’t help but notice the declining health of the grand old lady from the past when passing through Bulli. The Denmark Hotel, “The Little House on the Hill”, sits as a dejected monument to one of the region’s entrepreneurial pioneers. Old Bulli village C1880, showing inset Orvad’s Denmark Hotel. A single storey weatherboard and slab dwellings. “Orvad’s”can be seen painted on the side of the building. Expectations are high, but not assured that the exterior of the building will be saved after a Sydney developer’s intentions to restore the Denmark as upmarket residential apartments. Work, however has stalled, and word is that the developer is experiencing problems with Wollongong City Council. The former pub was established by Danish immigrant Jents Peter Oluf Orvad in 1877. Orvad served in the Danish Navy before immigrating to Australia with the fall of Denmark to Prussia in the 1864 war. He arrived in Sydney in 1866 and by 1869 had made his way to Wollongong, marrying Honorah Madden. Anglicising his name to Peter, he entered the hospitality trade in 1871, purchasing the George’s River punt and setting-up a cottage for meals and accommodation on its southern bank. Later, in 1873, he purchased a block of land three chains in length and 50 feet in breadth for £96 in Bulli village, leasing it to FW Edwards as a bakery. Appin Inn today. JP Orvad’s first pub in 1875. Orvad hosted his first public house at Appin, where he was granted a license for the Appin Inn during 1875. He had a short stay at Appin and moved to Bulli the following year, gaining an innkeeper’s license for his little weatherboard bakery building, and giving it the sign of his homeland. The Denmark Hotel – fondly known locally as the Little House on the Hill – was licensed on February 19 1877. The inn was typical of the day with a tap room (public-bar), sitting room, and a couple of guest bedrooms, besides Orvad’s family quarters. It was small and cramped, and the following year he added a single storey wing to the rear. Sir John Robertson, who stayed a night at Orvad’s “Little House on the Hill” at Bulli in 1879. Orvad was host to former NSW Premier, Sir John Robertson in January 1879 and of the four inns at Bulli, the Denmark became arguably the most respectable. Peter was said to have never served an alcoholic drink to a drunken man and kept a tight rein on operations at his pub. Meetings were often held at his inn to advance the community. Deputations were formed to approach the government for a post and telegraph office for Bulli, a court house, a public reserve and road improvements. He even stood for the parliamentary seat of Illawarra in 1880 but was convincibley defeated. Orvad went-up against wealthy capitalist and owner of the Coalcliff Colliery, Alexander Stuart, who later went on to become Premier of NSW. But the Bulli publican continued working for the community through his active role in the Bulli Progress Association, and he received government contracts repairing regional roads. Mr. J. P. Orvad, of the Denmark Hotel, Bulli, threatens to surpass everything in the hotel line in Illawarra, by his mammoth two storey premises now in course of erection. The Denmark Hotel, with its belvedere window used to spot coaches on the mountain pass and steamers arriving at the jetty, was now an imposing building among the other timber business houses in Bulli. 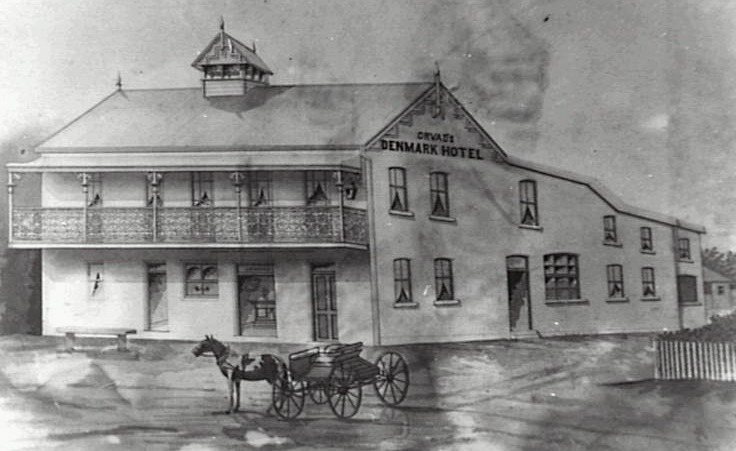 This sketch of the Denmark Hotel was given to Orvad in lieu of board and lodgings in about 1890. Orvad, who was suffering tuberculosis, had been considering returning to his homeland for sometime “now that Bismark is out of the way and Denmark not so fearful of further attacks of the German whale”, it was reported in 1890. However his health was failing and he never fulfilled his dream of returning to Denmark. 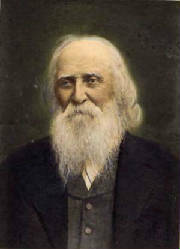 He died at the Denmark Hotel on November 27 1891 aged 48. The name of the hotel was changed to the Tourist Hotel in 1896 and it remained licensed until June 30 1911 when a local option poll – held at State elections to reduce licensed premises within an electorate – forced its closure. George Aston purchased the old Denmark from the Orvad estate and ran it as a boarding house from about 1913. Known as the Tourist Boarding House it remained in the family until the death of Maurice Bourke. Frank Gervaise purchased The Denmark from the Bourke estate in July 1998 with intentions of transforming it into a boutique hotel. However, due to financial difficulties he was forced to sell the building in 2011 to a Sydney developer, who now intends converting the building for residential purposes. Is this the way forward for the Denmark?